Lviv is an amazing city. It is so much better than I ever expected. It is a city of artists, foodies, and musicians. It has a strong sense of history but is forward-looking. When I arrived at Lviv airport, Tatiana and her 11 year old daughter Zhenya were there to greet me. Tatiana runs an organization in Lviv called “Nashe Yarmarok” that works on urban gardening and permaculture in the city. There is so much love and playfulness in her family. 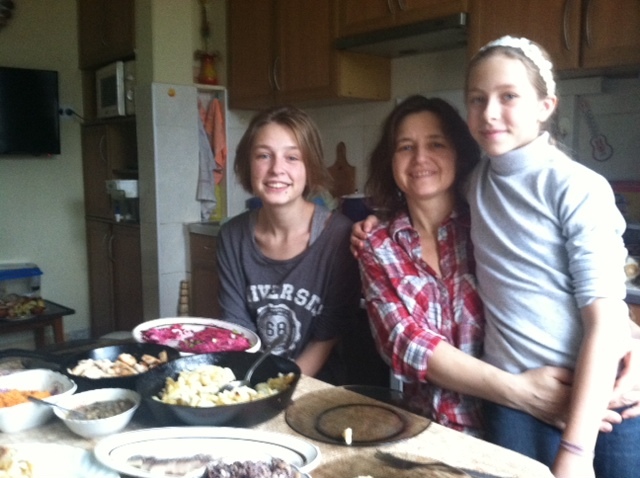 When I arrived at their home on the outskirts of Lvov, I was greeted by a turtle, a chincilla, a hamster, her 18 year old daughter Sasha, grandma, grandpa, and a Christmas dinner! 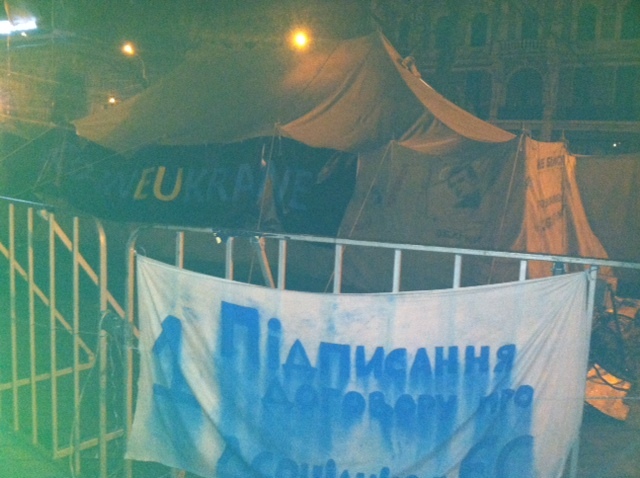 Euromaidan tent- just like OWS! My family, like many Ukrainians, celebrates Christmas eve, “Sviat Vechir” on January 6th and Christmas day on January 7th. I celebrated Sviat Vechir with my family on January 5th, flew out on Ukrainian Christmas eve, and arrived on Ukrainian Christmas day (Januar 7th). The stores were closed but all of the people were on the streets, dressed in costumes and singing in Vertepy, traditional holiday troops that perform plays featuring kings, queens, angels, devils, and of course, the Virgin Mary, Joseph, and the baby Jesus. The performances range from serious to greatly humorous, with great variety. After singing the Christmas carols I grew up with and eating a delicious meal, Iliya, another permaculture course participant from Belarus, met us at Tatiana’s apartment. After eating again, we went out on the town to see Lviv at night. 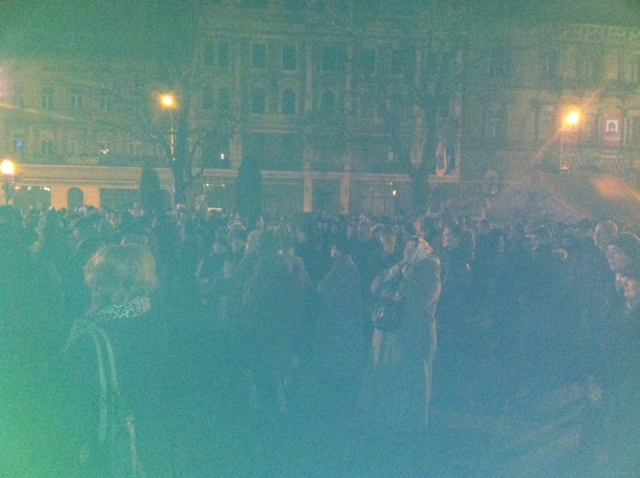 We went to a big square where the Lvivska Maidan was camping out. It was just like Occupy Wall Street, but better organized, it seemed. 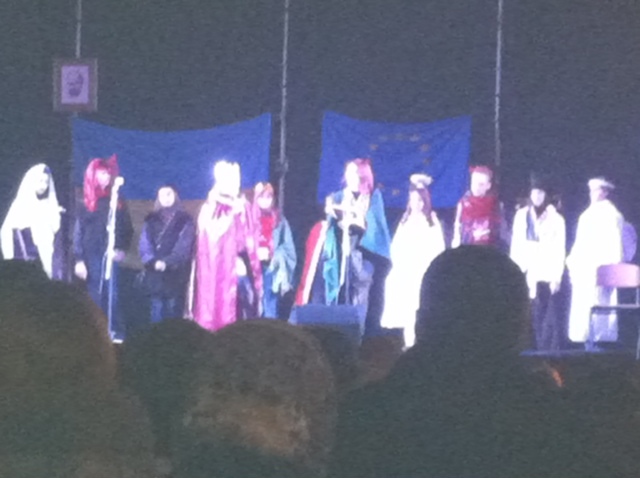 There, people were also perfoming radical Vertepy, singing carols in costumes. I saw a poster reading, “Ivan Franko stood with Europe- where do you stand?” Fireworks were streaming through the air and people were singing on stages and on the cobblestone streets. There were so many interesting works of art that we found, for example, a store called “Native Mind” where I found works of art and fashion that were cooler than anything I’d seen in Brooklyn- and cheaper too. Great music! 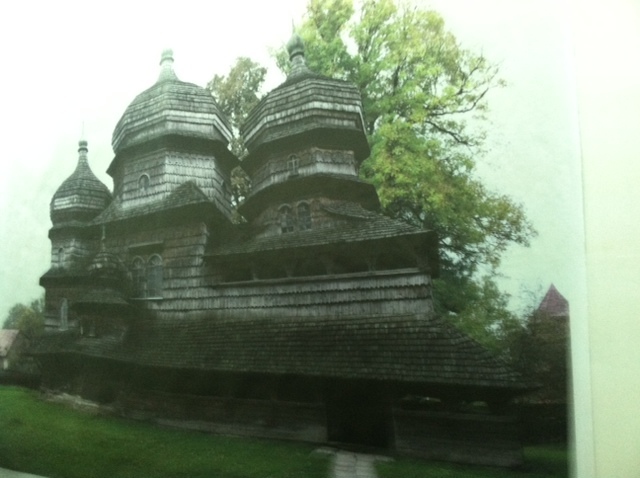 We also visited an artist who was painting icons on the shingles of an old famous church- one for each day of the year. Lviv is also a very delicious city. We visited a boutique where people made their own hard candies by hand. I’m not a fan of hard candy but this stuff was incredibly delicious! 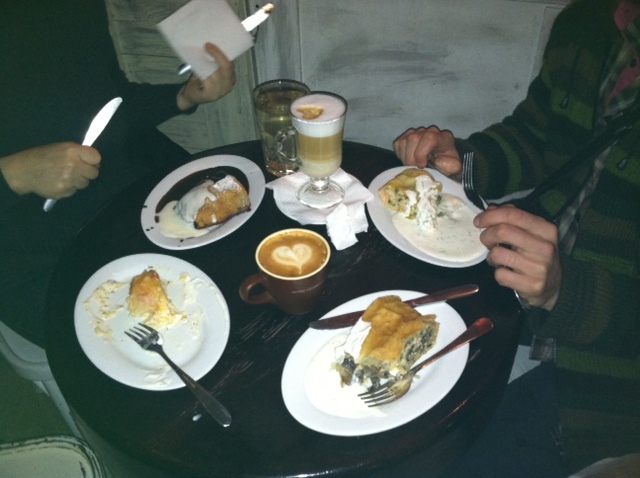 We went to a chocolate factory with rivers of chocolate running through it, a coffee roasters, and finally, a strudel cafe. I don’t like strudel, but I guess I’ve never had fresh Ukrainian strudel. I had mushroom strudel with garlic sauce. Insanely good! Then we came home. I went to bed only to have them wake me up to eat more with them at around 1:00 in the morning. This is a very food-oriented culture. We’re on the road to the permaculture course now, with Iliya at the wheel, munching on second breakfast as we speak. I’m on a real adventure, that’s for sure. I will keep all of you posted.